Application lifecycle management (ALM) delivers governance, development, and maintenance for application software. Requirements management; design; build; testing; and change, integration, project, and release management are major elements of ALM. The modern software development process is complex. The traditional software development lifecycle (SDLC) applies only to the development process, while ALM works for the entire application lifecycle, from planning to deployment. ALM software solutions enable software development teams to manage their project status from requirements to delivering releases and also help organizations fulfill their business goals. ALM software solutions are now adopted in many industries, including automotive, healthcare, and even BFSI. The rapid uptake of mobile devices and the growth in the number of browsers/platforms globally has generated the creation of a large number of mobile applications that require an efficient application development lifecycle. The growing number of mobile devices would also lead to multiplatform complexity, which in turn increases the demand for ALM solutions. The need for greater efficiency across teams and increased engineering productivity are also factors that drive the market for ALM globally. Challenges such as lack of visibility in requirement management, poor communication, and lack of traceability between requirements and other artifacts through the software development lifecycle swell the growth of the ALM market. With ALM software, engineering, development, and quality assurance teams are more productive and deliver quick output, increasing the efficiency across the software development teams as well as accurate allocation of human and technology resources. The aging of the systems development life cycle (SDLC) infrastructure also drives the market for ALM worldwide across various sectors, as SDLC has a rigid design and inflexible procedures for partitioning the project into stages, which creates difficulties in estimating the time and budget for each stage of the project. The global ALM market generated revenues of US$ 2.04 Bn in 2014 and is projected to expand at a CAGR of 8.9% during the forecast period (2015 – 2023) to reach US$ 4.39 Bn by 2023. On the basis of end-users, the ALM market is segmented into automotive and transportation, aerospace and defense, BFSI, energy and utilities, retail, healthcare, IT and telecom, and others segments. Rapid industrialization and technological advancements have increased the demand for ALMs in the IT and telecom and automotive and transportation sectors. Furthermore, the growing prevalence of health issues has led to emergence of various advanced technologies in healthcare sector, further leading to a significant pace of growth for the healthcare segment of the ALM market. North America and Europe are the major geographies that drive the growth of the global ALM market. In 2014, key ALM vendors included Atlassian Corporation Plc, CollabNet, Inc., IBM Corporation, Inflectra Corporation, Micro Focus International plc, HP Development Company, L.P., VersionOne, Inc., Microsoft Corporation, Parasoft Corporation, and Polarion Software GmbH. This report on the global ALM market provides analysis for the period from 2013 to 2023, wherein 2014 is the base year and the years from 2015 to 2023 are the forecast period. Data for 2013 has been included as historical information. The report covers all the prevalent trends and technologies playing a major role in the growth of the ALM market over the forecast period. It also highlights various drivers, restraints, and opportunities expected to influence the market’s growth during this period. The study provides a holistic perspective on market growth throughout the above forecast period in terms of revenue estimates (in US$ Mn) across different geographies, which include North America, Europe, Asia Pacific (APAC), Middle East & Africa (MEA), and Latin America (LATAM). The emerging IT applications are changing the way business is done today. The integration of ALM is necessary in order to remove inefficiencies and blocks in the software development lifecycle process. ALM helps a company to develop the best virtual methods for every phase of the software application process, including research, requirements planning, prototyping, engineering, design, time to market, programming, testing, risk management, defect tracking, and measurement. Benefits such as business agility, enhanced organizational agility, and improved resource utilization provided by ALM have significantly increased the demand for this technology worldwide. North America dominates the overall market for ALM globally owing to surging technological advancements and automation in this region. This research report provides in-depth analysis of the global ALM market on the basis of component and end-users. The ALM market based on component includes software and services. The software component is sub-segmented into on-premise and cloud-based ALM solutions, which are further sub-divided into agile-centric ALM and process-centric ALM. The ALM services is segmented into consulting, professional, operation, and maintenance. The ALM end-user segment comprises automotive and transportation, aerospace and defense, BFSI, energy and utilities, retail, healthcare, IT and telecom, and others. 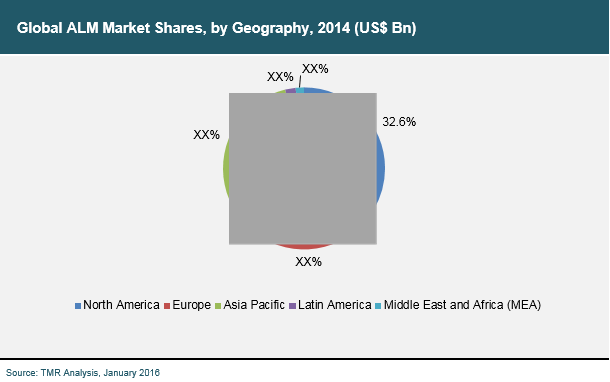 In terms of geographical regions, the report segments the global ALM market into North America, Europe, Asia Pacific, Middle East & Africa (MEA), and Latin America; the regions are analyzed in terms of revenue generation. The report provides cross-sectional analysis of the global ALM market in terms of market estimates and forecasts for all segments across different geographic regions.